This delightful bear mask would be perfect for role playing Goldilocks and the Three Bears. Laminate the masks to make them extra durable and add to the dressing up box! Children all seem to love elephants - and with our printable elephant mask they can enjoy dressing up as one and stomping about! Here's a fox mask template to print and use to make our fun (Fantastic Mr) Fox mask. Also used to make our badger mask. Print our cute giraffe mask on to card, cut out, laminate and punch holes to tie elastic on. Perfect for dressing up days at school or to add to a costume box for play. This cute printable hippo mask is a fun addition to any costume box, perfect for African animal themed plays and make believe. Pop this kangaroo mask on your children and see if it helps them find their bounce! Print several and use for bouncing relay races! Kids can dress up as a kitten for Halloween or anytime with our handy printable kitten mask! The second of kitten masks features a lovely cream kitten. Use for dressing up, plays, or perhaps with our mouse mask for games. Why not dress up as a cuddly koala? 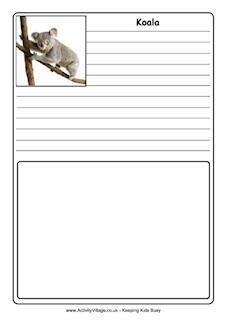 Print our koala mask on to card, cut out and laminate, punch holes in the side and tie on elastic. Children will love to play at being 'King of the Jungle' in our printable lion mask. You could use it as part of a Narnia project to dress up as Aslan! The uniqueness of the platypus is definitely appealing and this one is exceptionally cute. Children can learn about Australian animals by dressing up with our handy printable platypus mask! This cheerful looking sheep mask is sure to be a useful addition to a dressing up box. It's perfect for nativity plays or some farmyard themed dressing up play. Wolves feature in many children's stories so whether you are acting out Little Red Riding Hood or Peter and the Wolf or any other story our printable wolf mask is sure to come in handy. Print our zebra mask on to card, cut out and punch holes either side for elastic. Fun for an African animal or zoo themed play or for dressing up anytime!